Jang Hyunsoo has made his last mistake for the Korean national team. On Thursday, the KFA’s Sports Fair Play Committee (Disciplinary Committee) announced that Jang Hyunsoo received a lifetime ban from playing for the national team as well as a 30 million won (~$26,000) fine for submitting fraudulent documents about his community service. To get an understanding of how it came to this, we have to go back to the 2014 Incheon Asian Games. For that tournament, Jang was captain of the team that won a gold medal and earned military exemption. For athletes who have earned a military exemption, there are still two requirements placed upon them. They must complete basic military training, usually lasting one month, at any time that they can (eg., during the football offseason). In addition, a 2015 law mandated that all athletes would be asked to complete 544 hours (roughly three weeks) of sports-related community service. It was here where Jang ran into trouble. 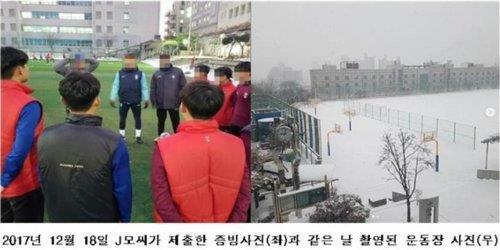 Jang submitted photos and documents claiming that he performed 196 hours of community service in December 2017 by teaching sports at a school. Unfortunately, during a parliamentary audit meeting for the Military Manpower Administration (the army), Rep. Ha Taekyung of the Bareunmirae Party accused Jang of fraudulent records for a very simple reason: it was snowing the days that Jang claimed to have done community service. Just like attempting a sliding tackle in the penalty box during the Mexico World Cup match, this was a rash decision. Why would you claim to do community service outdoors right in the middle of the Korean winter? I mean, look at that picture. It’s just implausible to think that someone would believe that the weather was nice enough to teach sports outside. Also, to make this even sillier, remember that Jang claimed to have completed 196 hours of his 544 hours. However, Rep. Ha claimed that all of Jang’s pictures were taken on the same day. Basically, this was not going to fly and good on Rep. Ha for calling BS on this. In my opinion, this was incredibly ungrateful behavior from Jang. He was given the great opportunity to have his 21 month military service requirement waived so he could pursue his football career. What does he do with that generous opportunity? He tries to trick the government into believing that he has completed one of the smaller requirements they have placed on him. The KFA was placed in an unenviable spot with how they would respond to this scandal. The KFA clearly knows that at the moment they are experiencing a rebirth of interest in the national team (evidenced by 4 straight sellout friendly crowds) and did not want to lose the public’s trust by letting Jang off easily. On the other hand, head coach Paulo Bento has lavished individual praise on Jang’s play in the past two international breaks. In the end, the KFA made a strong decision and banned Jang from the national team for life. Thinking of all the men who have served their military duty, the KFA made the sensible decision to take a hardline on this behavior. It just would have been a slap to the face to all those men if Jang were to be allowed to continue to represent his country after pulling a stunt like this. You could even make the argument that there could be fans so upset about Jang escaping punishment that they would stop going to matches and supporting the national team. Military duty is not some joke and it’s unfortunate that Jang thought he could treat it as such. So I say: “Goodbye Jang Hyunsoo.” We won’t miss you. What a boneheaded move. Never would I have guessed that THIS would be the reason why Jang HS would no longer start for the KNT. I really wonder if this hadn’t occurred, how long he would have been in Bento’s good graces… Guess we’ll never know. It’s time for the time to move on. Anyone know if any of his former KNT teammates have commented? I haven’t heard of any KNT players commenting. Bento also says he respects the KFA’s decision. Players like Ki and Sonny will definitely not want to make a controversial statement. The KNT players with exemptions will now know they gotta get that community service done and the KFA pledged to start more programs to help players do so. Hopefully everyone can learn the right lesson. The KFA made the right decision.